A smaller version of the Probe Tip (for babies/toddlers & smaller mouths)|||ARK's Mini Tip is a smaller version of the Probe Tip - our most versatile tip attachment for the Z-Vibe®. Its smaller size is perfect for babies and toddlers, and its rectangular shape features three different surfaces: bumpy, striated, and smooth. As such, the Mini Tip provides a varied sensory experience as you stroke and apply gentle pressure to the gums, palate, cheeks, tongue, and lips. This sensory input can help "wake" up the mouth and increase oral awareness for individuals with hyposensitivities. Or, it can also help decrease oral defensiveness and food aversions for individuals with hypersensitivities. This can vary depending on the mouth size, but typically we recommend them for children up to the age of 2.5 years. 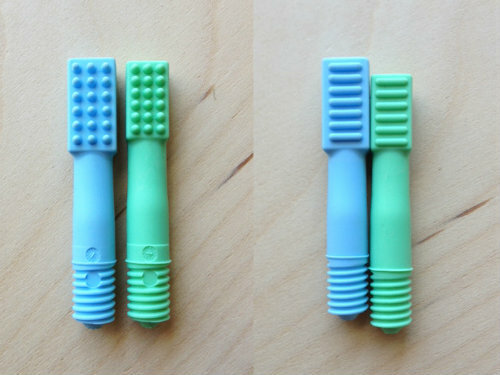 For older children through adults, we recommend the Probe Tip (same shape, just larger in size). How does the Mini Tip compare to the Probe Tip in size? Their overall dimensions are the same. But the head of the Mini Tip is smaller than the Probe Tip (see the image below for a comparison). Since it's more petite, the Mini Tip is for children up to about the age of 2.5 years. For individuals over the age of 2.5 years, check out the Probe Tip here.